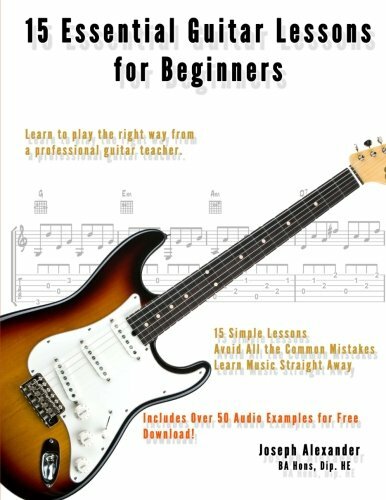 Written by a professional, full time guitar teacher, 15 Essential Guitar Lessons for Beginners, teaches you to play the right way from the first time you pick up the instrument. "The most common scenario I come across as a guitar teacher is the adult who is self-taught with bad habits: Things that should be sorted out on day one and have been left unchecked for years have developed into brick walls stopping any progress. These fundamental problems need to be sorted out before the student can improve and sadly it takes a long time to un-learn and re-train an ingrained habit. I wrote this book to try to help people get things right, right from the start". This isn't a theory book; It's not all about posture or technique. It's about getting the simple, essential things right, whilst quickly building the important skills you need to play the guitar. It's all about playing and learning music whilst keeping in mind the foundational techniques that will allow you to continue to grow as a guitarist, long into the future. A professional guitar teacher for over 12 years, Joseph Alexander graduated from The Guitar Institute in London with a Diploma in Popular Music Performance. He continued his education at the prestigious Leeds College of Music achieving a BA (Hons) in Jazz Studies in 2002. Immediately following his graduation Joseph was awarded a bursary and internship writing music for the West Yorkshire Playhouse where he composed scores for three individual works. Music has taken Joseph all over the world. He has performed on little islands in Thailand and 100,000 ton ocean liners in the Caribbean. He currently lives in Poynton, England and is busy teaching a new wave of upcoming guitarists. He has often worked as a peripatetic teacher in Cheshire schools and at times has over 40 weekly private students.